Home > HYPER V	> How to move hyper-V VM from windows 2008/R2 host to another host if its contain multiple AVHD files ? How to move hyper-v VM to another host if its contain multiple AVHD files. Source Host : Windows 2008 R2 Hyper-v. Backup the VM’s before start merging process . The test VM shown below is currently running and it has a snapshots. All AVHD file is merged into base VHD and now you will not see the AVHD files. 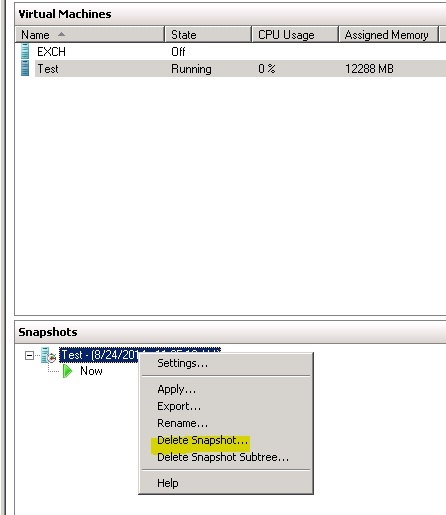 It cannot directly move VMs from 2008 R2 to 2012 R2 by import\export. So just create new VMs on the destination host with option attach existing virtual hard disk.